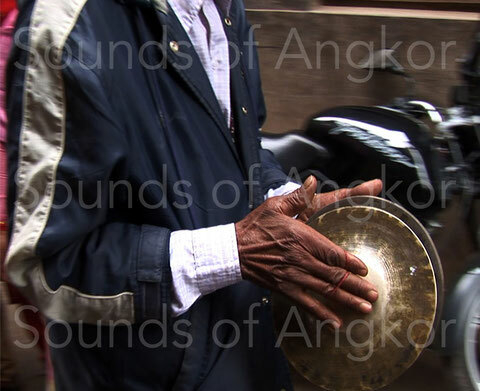 Cymbals - Site de soundsofangkor ! Cymbals are widely represented in iconography and are present in all orchestral formations: military, palatine, religious, entertainment and even to accompany the work. Some original bronze objects have survived. In all the properly Angkorian representations, the two elements to be clinked or rubbed are held one above the other, the left hand underneath. The two elements are either connected by a cord or are free. In general, they are shown separated by a few centimeters or closed. 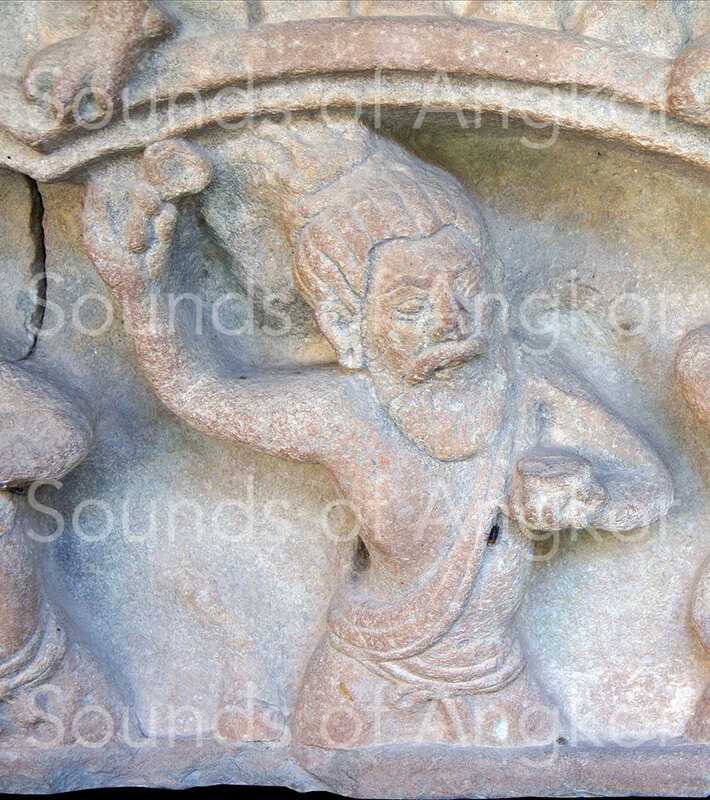 On a pre-Angkorian lintel of Sambor Prei Kuk (7th century), the musician strikes them with vehemence. His right hand seems to hold a handful. 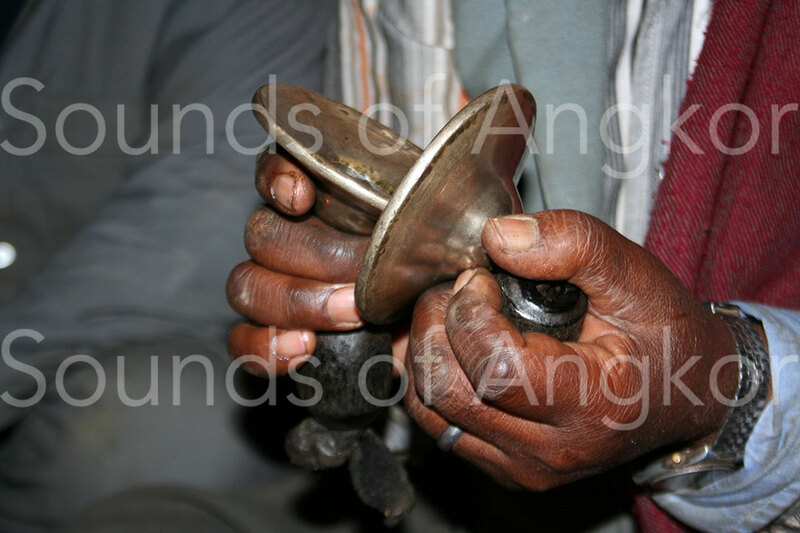 The Newar of the Kathmandu Valley in Nepal use this kind of instrument in the Bhajan music to praise the deities of Hinduism. Unlink cymbals for ritual use. We can see the handle in the right hand. Sambor Prei Kuk. 7th c. National Museum of Cambodia. 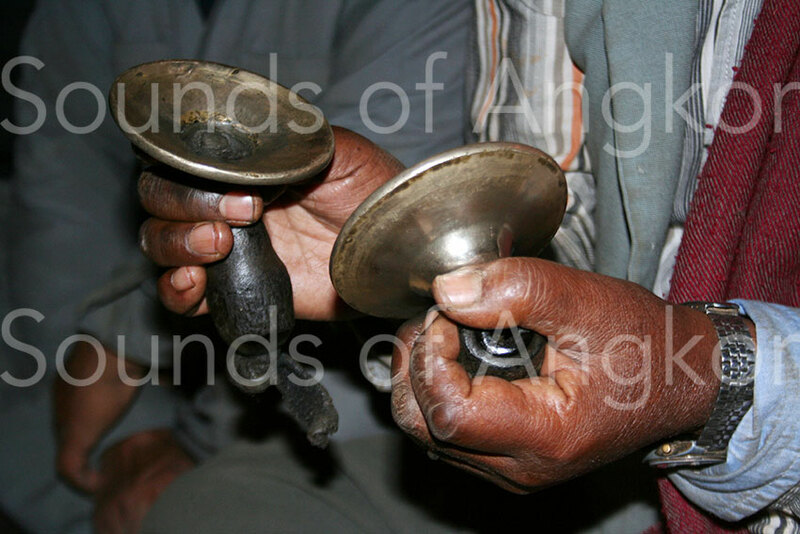 Unlinked cymbals with handles used to accompany devotional Hindu singing bhajan in Bhaktapur, Nepal. 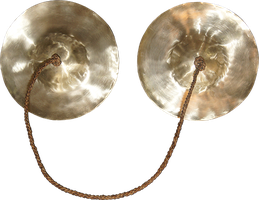 Linked cymbals for military use. Angkor Wat, south gallery, 12th c.
To the left, a Cham warrior seems to play cymbals. If this were proved, it would be the only representation of this instrument in this light. It could also be a cylindrical drum seen from the front, but no carrying strap appears. Bayon. The prehension technique of these cymbals could corroborate the hypothesis advanced about the photo of the left. Newar, Kathmandu Valley, Nepal. 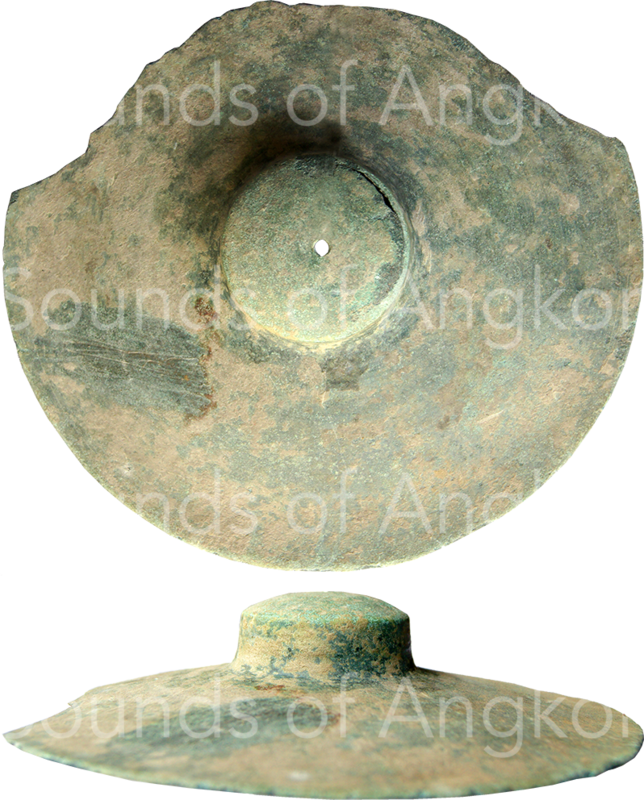 Archaeology has mostly delivered thick cymbals in bronze with a hemispherical or conical cap (1, 2). 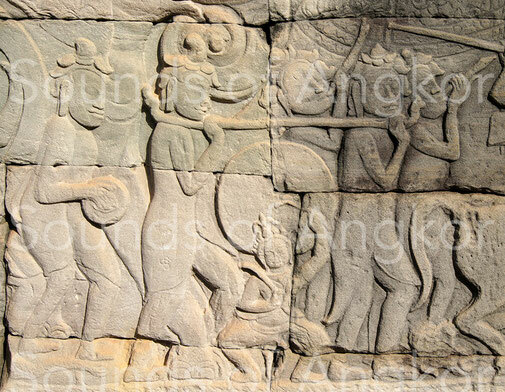 But thin ones, with solid handle have been found in Banteay Chhmar (3). They are 22 cm in diameter. 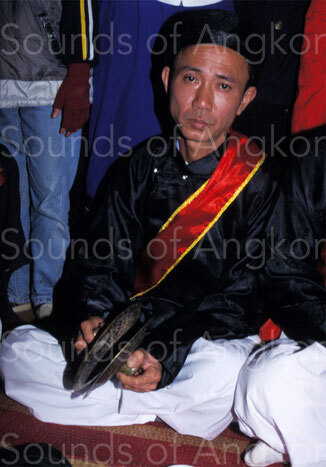 This type of instrument is still used in Vietnam (4). 1. Bronze cymbals with hemispherical cap. National Museum of Cambodia. Unknown Dating. 2. 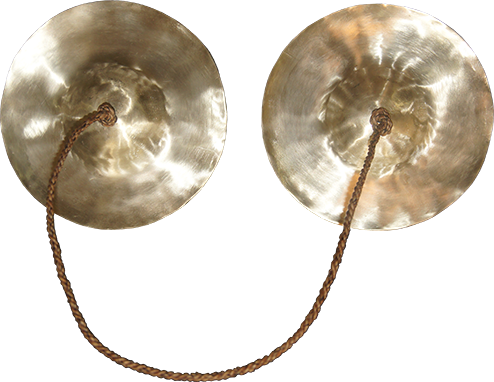 Bronze cymbals with conical cap. National Museum of Cambodia. Unknown Dating. 3. Bronze cymbal with solid handle. Found in Banteay Chhmar. Wat Bo coll. Unknow dating. Copper alloy cymbals of the same type as photo 3. Vietnam. 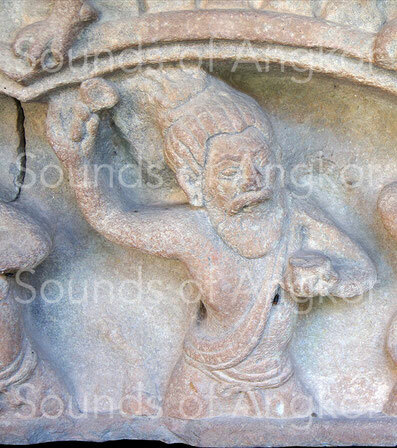 Two distinct terminologies appear in Old Khmer texts: tāla or its variant tāl, derived from Sanskrit tāla or tala and cheṅ associated with the functional term chmāp designating the one who "manipulates" them. These two terms were indifferently translated by gong or cymbal(s) by the epigraphists. 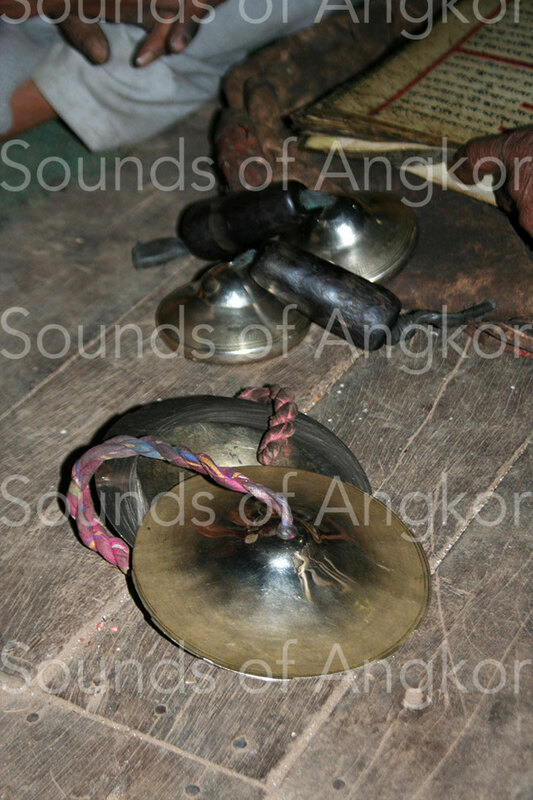 In the case of gong, it could only be, in the pre-Angkorian and Angkorian periods, flat gongs and not bossed ones. In his dictionary of Old Khmer, Saveros Pou brings a corrigendum. She proposes that tāla be translated as "gong" from Old Khmer. 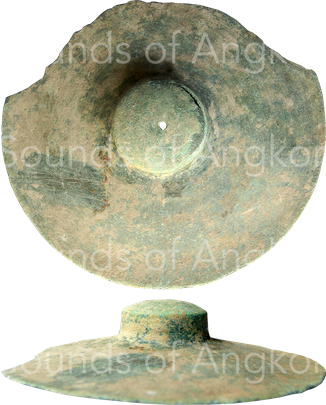 But we think that there is no need to systematize because no gong appears definitely in Khmer, Indian or Javanese iconography and archeology has officially given us no instrument despite a good preservation of the bronze. If cymbals are officially already out of the ground, the gongs are waiting! K.389, pre-Angkorian, kaṅsatāla piy samṛt - three tāla in bronze or brass. K.370, 11th century, tāla saṃmrit - tāla in bronze or brass. If one approximates the number of occurrences tāla of the exceptional quantity of representations of cymbals, the probability that the correct translation is the cymbals increases considerably. As for cheṅ, which also appears with a significant number of occurrences, we are tempted to reason in the same way. 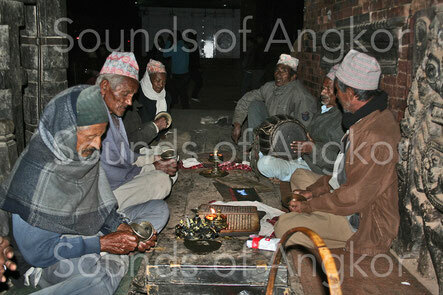 Moreover, the term chmāp, translated by Saveros Pou as "manipulator", demonstrates that there are, in the way of playing, other operations than a simple percussion of gong, which corresponds to the reality of the game of cymbals as evidenced by ethnology. Another argument reinforces this sense of importance of the cymbals in ancient Khmer society. 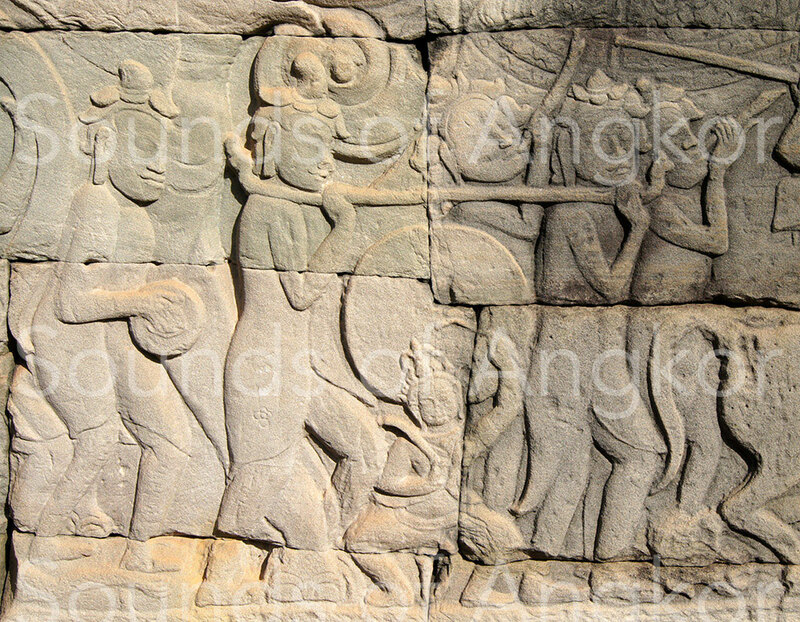 On this scene of the Bayon below which adjoins an image of temple builders, a manipulator of cymbals gives the cadence to five men equipped with sticks or dams with which they rhythmically strike the ground for the edification. Five characters dancing with sticks or dams, accompanied by cymbals when building a temple. Bayon. Singer of bhajan playing thin and thick cymbals. Bhaktapur. Nepal. Thick and thin cymbals accompanying simultaneously bhajan songs . Bhaktapur, Nepal.